In this Saturday’s edition, The Reporter has published an article about the problems the Addis Abeba governemnt has been experiencing regarding land administration. In parliament, its draft law was greeted with “heated debate” anew; however, the story has refrained from diagnosing what has caused the fire and heat in approving it now, even after much Ethiopia’s new ‘royalty’ have already seized their share of urban lands in all sorts of ways. The draft law was first presented to parliament six months ago, according to The Reporter, and “is considered to have taken the longest time” to get it amended or approved. Nevertheless, for reasons we could all easily speculate probably more realistically, the land issue has been deliberately reduced to problems of jurisdiction between federal and regional governments. In reality, this is not and should not have been the issue parliamentarians should waste time on. The practice from other countries is that the federal governments make laws, the regions replicate taking their particular situation into account. Since the problem is of a different and frightening nature, none of the politicians seem to want to have anything to do with spelling it out. The real problem behind this issue is the TPLF regime’s desire and efforts to regularize, legalize the largest urban land robbery in Addis Abeba’s history. This is happening exactly at the very time the new city government finds the land theft and illegal acquisitions unstoppable, as its latest findings have established. This is not one of TPLF’s sudden hiccups; nor is it spontaneous problem, arising from few loose characters here and there doing something illegal. There are evidences that inform this has been carefully planned by the TPLF from the get go – already long before it seized power in May 1991. This was also made evident during the London talks between the TPLF and the Mengistu regime, as Meles had signaled to the mediator in the talks US Assistant Secretary of State Hermann Cohen, who not long ago recalled in interview on ESAT. In the entire history of the TPLF, this has been the largest land corruption it has presided, including expropriations of properties of ordinary citizens and their transfer to TPLF members. Obviously, this transfer of wealth has turned its members overnight millionaires and large property owners. Ex-mayors Arekebe Equbay and Kuma Demeksa have played huge role in this. The fact of the matter is that the poor, the helpless, the ethnically and politically un-interfaced have been treated as old and valueless furniture to be pushed off sight and off prime urban lands. I could not help being surprised, when I read in the respected English paper The Guardian the substandard news report about Ethiopia, in reference to its creation of 2,700 millionaires from 2007 to 2013. The unfortunate effort was to show Ethiopia as one of the fastest growing countries in the world. I submit, it is rather an evidence against the journalist that he has failed to do his homework properly. If only he consulted the latest report of Transparency International, he could have seen, as I observed in my comment on The Guardian itself, Ethiopia is the 113th corrupt country out of 177 nations. The integrity, governance and accountability scores of its public service institutions adds only to 33 out of 100. It means that corruption is rampant in Ethiopia and its citizens have no confidence in the nation’s institutions. This is also what the urban land grab story in Addis Abeba corroborates, as corruption makes wealth for the few – those millionaires the paper refers to – misery for the majority breeding inequality of all forms and discrimination against the poor. In late September 2013, this page attempted to present its concern about the inequalities astronomically growing in Addis Abeba, urging remedial measures. The United Nations has also repeatedly warned about the danger of the inequality building in Addis Abeba. This is because, the prosperity of nations is linked to the judicious growth and prosperity of their cities, from where more economic activities radiate into regions. 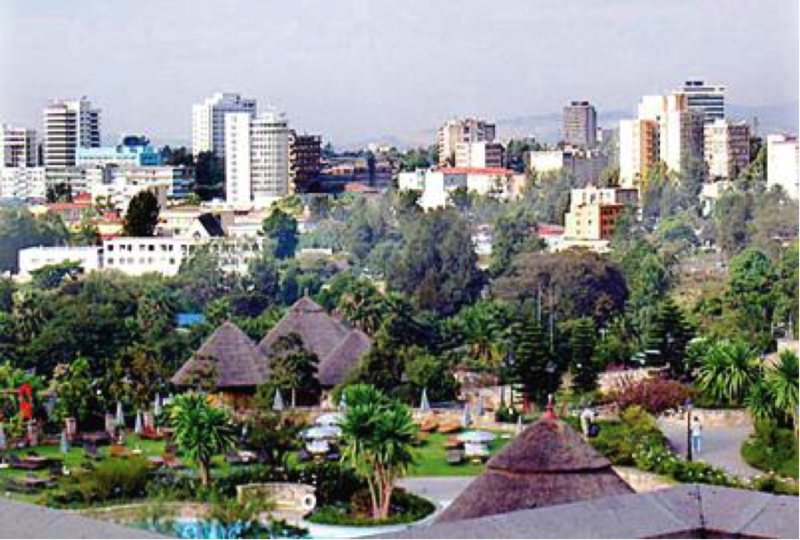 Addis Abeba failing in this, in in its latest report the UN has described it as a city with weak prosperity factors, examining the facts, the realities and the prospects using sophisticated tools known as City Prosperity Index (CPI). Consequently, based on those metrics, Addis Abeba has been identified as one of the increasingly iniquitous and exclusionary cities in the world. As our nation’s political, economic, financial and intellectual center, the widespread inequality in Addis Abeba and its growth is feared only to produce a nation of unequals. This is more so, especially in the light of the deliberate and tapering patterns of Ethiopia’s wealth distribution. To a large extent, acquisition is premised on looting and the regime’s misguided ethnic policy, including its nepotistic political power management it has imposed on the country, as sole means of its survival in power. Officials that abandoned the regime, including Ato Yohannes Tadesse Aka, former head in Addis Abeba City Administration of land and buildings permit department, have early on exposed their role, under direct instruction by Meles Zenawi, in allocating a third of Addis Abeba’s land to TPLF members. Also ‘publicly owned’ banks carried out the financing side exclusively to TPLF members to enable them build their villas and multi-storied buildings with the people’s monies on those lands. In a country with the largest number of generals for its economy, members of the defense forces lead the road in the robbery of land and in receiving free financing. Once this is done, these TPLF members systematically started building separate villages or took over existing ones within Addis Abeba along their kith and kin. That is how the new TPLF’s concentric circle of alliances of power and relations began to take shape as added line of protection and defense of the present order. In Addis Abeba today some of these separate and posh small towns within the city have taken names from places from TPLF’s original home, much like in the tradition of colonial settlers in a number of African countries. This is not oblivious to the historical arrangements in Addis Abeba. For instance, we have had these names such as Gojam and Wollega Berenda, Wollo Sefer, Sidamo Tera, or Teklehaymont (without the adjective), etc. These never had anything to do with land loots. They were a reflection of a sense of community of people from the same locality to live together – as do immigrants when they move to a new place, away from home. Moreover, in the old days those nomenclature served in Addis Abeba as addresses for transport goods that used to be unloaded from the region concerned. It had also been meeting point for relatives coming from the respective regions. In its article on the matter, The Ethiopia Observatory last September indicated that the institution of such misguided policies of inequality would automatically generate discrimination. That would become the new, new deterrence to our capital city and the country’s progress. We see those discouraged by their country fleeing, especially the youth wanting to escape from poverty, dehumanization and the lack of inspiration. One only need to consider the statistics of those that are being arrested on a weekly basis in Eastern and Southern Africa, after fleeing their country and illegally entering those countries. The signs have been there all along since this regime has come to power that there have been endless rounds of fresh exodus of Ethiopians, resulting in brain drain. We have become a nation of affluence for the few, as Addis Abeba has made sure it is also home for the dirt poor majority that is increasingly being pushed to the peripheries. As long as land is state-owned, the problem of ‘illegal’ land acquisitions by those who are politically connected will continue. No legislation short of privatizing land tenure in the constitution can prevent this. Ironically, land inequality and wealth inequality is increasing fast under a regime that is supposed to be ‘socialist’ or ‘state capitalist’. One sees the same situation in China, where the Gini coefficient is now higher than most free market countries. State capitalism promotes more inequality than free markets because in addition to the market’s inherent bias towards those with capital, state capitalism adds the power of the state to capitalists, thereby accelerating their growth. All growing economies experience increases in inequality to some extent, but free markets help mitigate inequality while socialist policies, including state ownership of land, increases inequality. I really hope that Ethiopian opposition politicians and academicians see this, in addition to all the other evidence around the world, put an end to their socialist infatuation, and start advocating for freedom and free markets, at least for land. Around the world, democracy and freedom and private land tenure are inextricably connected. Ethiopia is no exception.